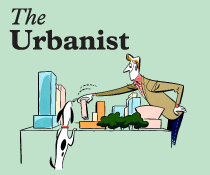 Benoît Peeters was interviewed in English for The Urbanist, a program of Monocle 24. The theme of this program was “Fantasy cities”. Besides the interview with Benoît, Peter Murray talks about his vision for 2050 and we hear about Beirut’s future plans. The interview with Benoît starts around 30“. This blog post was created on 2012-04-23 at 12:09 and last modified on 2018-05-06 at 08:40 by Joseph Le Perdriel.